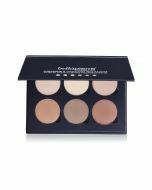 Bellapierre All Over Face Contour and Highlighting Kit was created to contour cheekbones and jaw line, and to highlight the cheek and brow bones. This kit provides you with all the essentials to enhance and compliment your facial complexion. Made with 100% natural minerals. Mica (CI77019), Titanium Dioxide (CI77891), Zinc Oxide (CI77947), Iron Oxides (CI77492, CI77491, CI77499). May contain: +/-[Chromium Oxide Green (CI77288), Ultramarines (CI 77007)]. Using the Bellapierre Mineral Foundation provided, apply all over the face with a Kabuki Brush to achieve a clean, blank canvas to work from. 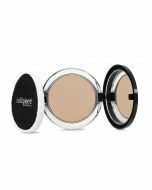 In this kit we have provided you with a Mineral Highlight Powder that will work as your highlighter, which focuses on brightening and emphasising your key features. Please refer to the face chart, to see which facial structure relates best to your features, and then proceed. Using the Concealer Brush provided, apply the highlighter from your lower eye lash line to the top of your cheek bone, filling in the area of skin in the middle (this should be quite a large surface area). Then go onto apply a small amount of the highlighter down the bridge of your nose, chin, and your forehead. This will bring out your key features which usually appear dark and puffy, to make them look brighter, healthier, and fuller. Once the highlighting has been completed, move onto the Mineral Contour Powder provided. This is your contouring shade and should be used when defining your facial features. Precisely apply this foundation in a thin line to the lower half of your cheekbone working in a diagonal motion following to your ear. Go onto applying the contouring foundation in the same way to either side of the bridge of your nose, outer edges of your forehead, and along your jaw line to slim your chin. Using the Kabuki Brush provided, blend the two shades on your face to create the subtle illusion of depth and dimension. This will make your face look sculptured and defined, while having a healthy iridescent glow that will look flawless.